Reusable Insulated Tote Bags Generate Booth Traffic Because People Love Them! Trade show marketing can increase the reach of your brand and reinforce your marketing message with customers and prospects. Consumer research shows that people love promotional products and reusable bags. This is partly because reusable bags are useful during a trade show but tote bags will continue to be useful and effective marketing tools long after the trade show is over. Our brand new Eco-Life insulated totes fill a consumer need and will effectively spread your branding message. Reusable cooler bags make excellent trade show promotional products. These bags are not your run of the mill trade show bag and people will be drawn to your booth to get one. In fact, we are using the exact bag to hand out at The PMA Fresh Summit for our trade show marketing. Our insulated tote boasts a durable design that is built to deliver years of dependable use for both your customers and your brand. A boarded bottom distributes weight for even carrying. Reinforced handles make easy work of supporting a heavy load. The outside pocket is great for stowing a shopping list, utensils, or other accessories. Your customers and prospects will carry hot or cold items with ease and think of your brand each time they use your bag. Our Eco-Life insulated tote stands out when it is embellished with full-color printing. Artwork with intricate details and vivid colors pop and really stand out. 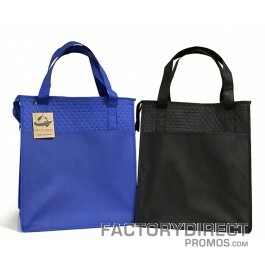 Using the full surface area of the bag also gives you more space to make a case for your brand. useful during a trade show, because your customers can use it to carry the various business cards, catalogs, and other items they pick up. The convenient construction means this bag will get lots of use after the trade show is over, too. Whether your customers use your custom branded insulated tote to carry groceries home from the store, takeout home for dinner, snacks on a trip or even as a lunch bag, it is sure to get lots of use. The more use your branded bag gets the more exposure your brand receives. Trade shows provide a great opportunity to reach your customers and prospects and build relationships and sales. A show stopping, functional promotional product will get people to your booth and ensure your trade show marketing efforts extend far beyond the show floor. Don’t wait. Contact Factory Direct Promos to make an impression for years to come. Provide a beneficial, eco-friendly promotional item your customers and prospects will love. Request a full-color quote on our newest reinforced insulated tote. Previous Previous post: What Are Recycled Bags Made Of? Are You Making This BIG Mistake When Recycling? Pingback: Here's How to Save BIG On Your Promotional Marketing!